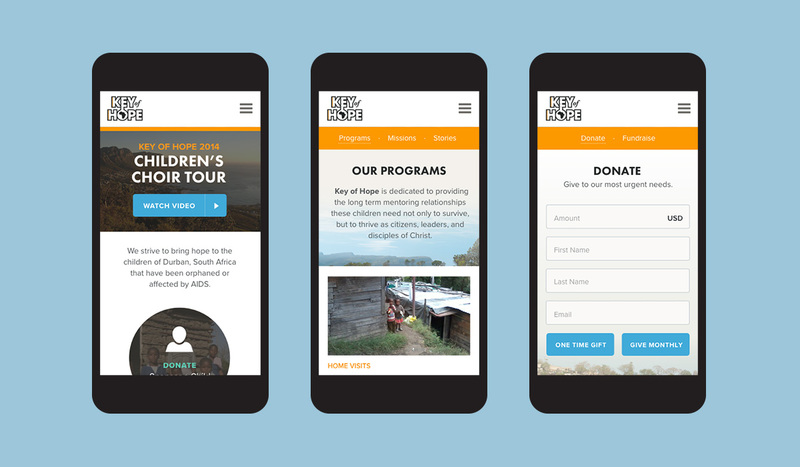 A new donation system, store, and event ticket sales make it easier than ever to give as this non-profit displays the many ways it has been improving the lives of South Africa’s children. Key of Hope is dedicated to providing long term mentoring relationships to children in Durban, SA, helping them not only survive, but thrive. With great need and an important mission, they needed a way to clearly communicate the important progress that was being made and allow people to contribute. The new website features a donation system that simplifies giving while allowing for options including giving to specific areas of the organization. After exploring content, donation links on key pages of the site direct visitors to the Donation page with options for one time or monthly contributions. An online store allows Key of Hope to sell artisan crafts and souvenirs. The Stories section of the site is updated regularly with accounts that range from uplifting to harrowing and depict the extremes many in this South African community experience every day. A new visual style expands the limited brand assets to create visuals that are modern, friendly and appealing. Key of Hope has seen a dramatic increase in giving since launching the site.